In 2016, Eva Koťátková led a workshop within the KAT18 project together with a group of seven artists who work there: Nicole Baginski, Tanja Geiss, Patrick Henkel, Susanne Kümpel, Andreas Maus, Michael Müller and Anna Rossa. 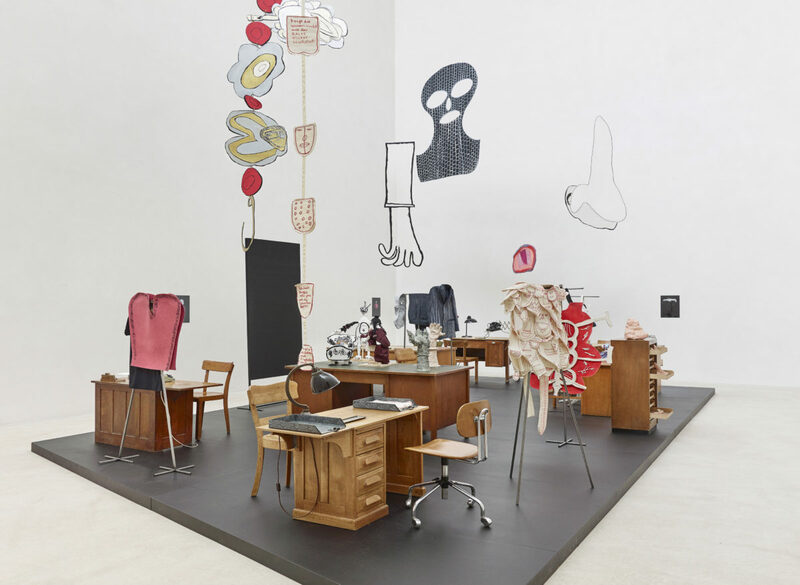 They formed an Office for the eyes, nose, mask, tongue, heart, hand and mouth, a new machinery, a temporary organism which shared a particular space and created a series of works: drawings, objects, costumes, texts and performances. Each of the creators focused on one of the body parts (or what concealed or replaced it). The language, equipped with limbs, became an independent figure. The over-proportioned eyes displayed its interior coloured depending on a specific emotion, the nose became a tool of communication – suddenly the mouth was not needed for speaking; the arms became independent of the body and were changing into figures or entire situations, the heart showed all its wounds, the eyes became a mask, and the mask became the new face. The body parts tried new situations and functions and developed alternative methods of communication. Little by little, new rules, standards and scenarios were emerging, depending on the needs and the nature of a specific body part. The Office for the eyes, nose, mask, tongue, heart, hand and mouth was first presented in the Kolumba Museum in Cologne. In the Museum Kampa, the shaping and operation of the Office features Dominik Lang, who led the workshop within the KAT18 project together with Eva Koťátková in 2018. Now they have become the architects of the exhibition – the Office together. Robert Kunstmann, another artist involved in KAT18, made 7 videoclips for the exhibition – portraits of the artists and the peculiar works of art at the same time. The Office for the eyes, nose, mask, tongue, heart, hand and mouth was created in close cooperation with Jutta Pöstges, the leader of the KAT18 atelier, ensuring conditions for artistic work for the creators labelled as “handicapped artists”. KAT18 strives to influence the rhetoric associated with the terms such as handicap or disability and the social stigmatization related to those issues in the long term.